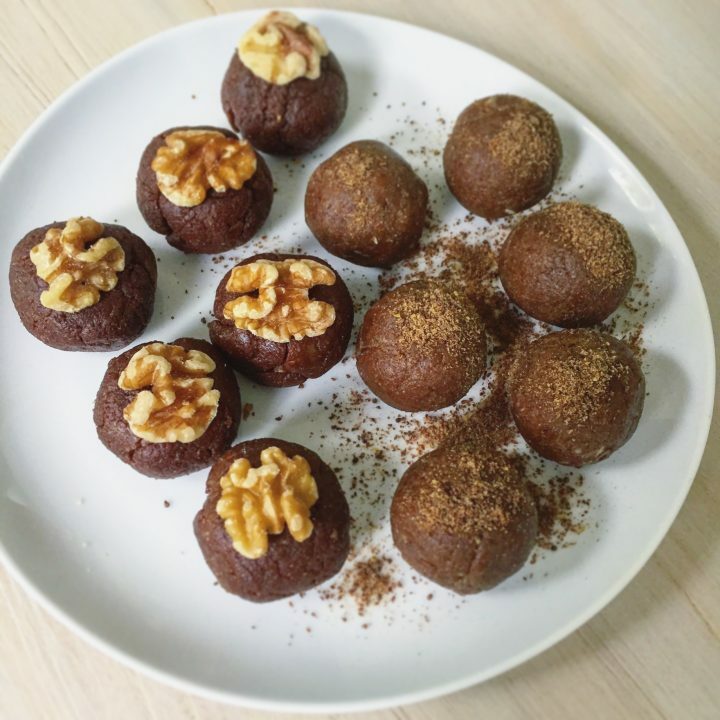 Mike tells me these are my most delicious bliss balls yet! I don’t know if I can choose between them all, but they definitely are a winner… not just because they are tasty but because they are probably the most nutritious I have ever come up with! I set out to make a bliss ball that was rich in Omega-3 and could add to my daily intake of 1-3 tbsp ground flax. In each ball, there is almost 1 tbsp flax! Not to mention other sources of omega-3 like walnuts. Interestingly, I used dates, which I don’t normally do, but wanted to keep a healthy balance between fats and carbohydrates. As you know, the more longer I am plant-based, the more convinced I am of eating a plant-rich diet full of natural sugars from fruits and even dried fruits. I do not fear these things any longer! Our bodies can handle them and thrive. This a bliss ball to have on hand week-to-week! Pit the dates and soak them in warm water. Grind the dry ingredients in a food processor until broken down and well combined. Drain the dates and place them in the processor with the vanilla. Blend until a sticky dough. Roll into ping-pong sized balls, sprinkle with additional ground flax/coconut/seeds or keep plain. Refrigerate in an airtight container.